It gave its name to an entire suburban district of our city – Chromepet. But of the factory or the several acres it occupied at one time, there is not a trace. In its time, it was a well-known employer of the city and its products found a ready market in India and abroad. The Chrome Leather Works was founded by George Alexander Chambers in 1913. He was an old Madras hand, having first come here in 1894, at the age of 26. For ten years prior to this, he had worked in the leather trade in London. Arriving in Madras, he worked his way up in a private company whose name is not known and, in 1903, opted to branch out on his own. This was a trading entity and he exported hides and skins. But his heart was in setting up a tannery of his own and, within a few months of being in business, he managed to cobble the necessary capital to set up such a facility in Pallavaram, then “12 miles distant from Madras”. Here he pioneered the process of chrome tanning in the country. The firm of Simpson & Co became interested, for this was an era when they were into making custom-designed carriages and needed leather for the seats. 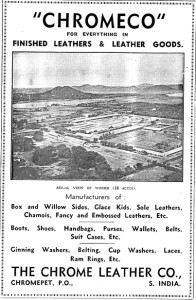 They entered into a collaboration with Chambers and the new entity, with a tannery in Tondiarpet, came into existence under the name of Brown & Co. This, however, did not prosper and when Simpson’s withdrew, Chambers agreed to take over the assets of the company. It was renamed Chambers & Co and became one of the principal members of the British-dominated Madras Chamber of Commerce, then a powerful representative body for trade and manufacturing interests across the entire Presidency. The chief cause of failure of Brown & Co had been Chambers’ inability to make chrome tanning a commercial proposition and he became bitterly opposed to the process itself, preferring to revert to traditional methods. In the mid-1900s, the Government of Madras began pondering over ways and means to create an industrial appetite among Indians in the Presidency. It appointed Alfred Chatterton of the College of Engineering to come up with schemes and he, after due study, suggested several alternatives, including pencil manufacture, soap making, aluminium processing and chrome tanning. In all of this he was strongly opposed by the Madras Chamber, which abhorred the idea of Indians taking to business. And within the Chamber, it was Chambers who stridently criticised Chatterton’s attempts at chrome tanning. He was of the view that the process was unsuited to Indian conditions and predicted that Chatterton’s scheme was doomed. But reality turned out otherwise. It was a bitter pill, especially because Chatterton had enticed a key employee of Chambers to prove that chrome tanning was workable. The Government was delighted and Chatterton was knighted in recognition of several of his pioneering efforts. But it was Chambers who made money out of chrome tanning. He worked with a convert’s zeal and, by 1913, set up the Chrome Leather Company (CLC) in 25 acres of land in Pallavaram, at a site that was described as possessing “a good elevation, and with excellent water.” It is pertinent to note that the area, which became Chromepet, does not have either attribute today. The old Chambers & Co became the Managing Agent for the CLC, its tannery in Tondiarpet having closed owing to an outbreak of malaria in that area. By the 1930s however, competition blunted CLC’s edge, what with several British companies jumping into leather and many Indians being attracted to it as well. Nevertheless, CLC remained a name to contend with. George Chambers died on November 16, 1937. He had married three times, and it was his last wife, Ida, and Roy Edwin, his son through his second wife, who inherited the business. The two did not see eye to eye and eventually it was Ida who ran CLC, leaving Roy Edwin to other pursuits, though he did not relinquish or sell his share in the business. Ida, by all accounts was a tough character, who stayed on in India post-Independence and managed CLC, seeing it through many labour troubles and other problems that plagued enterprises in the 1950s and 1960s. In this she was helped considerably by M Subbaraya Iyer, the famed lawyer, who was her advisor. When he won a tough labour case for her, he requested that his fee be given as donation to a pet project of his – the Vidya Mandir School. An entire wing was named after her in gratitude. By 1965, Roy Edwin and Ida reached an agreement to sell CLC. The Company was purchased by A Nagappa Chettiar, leather baron extraordinary who did much to make Tamil Nadu a major in this sector. Ida Chambers bequeathed most of her share of the money to charity before dying in 1968 in a road accident. Nagappa Chettiar, in the meanwhile, made a success of the CLC, introducing leather boards out of cuttings and also developing leather washers. It appeared that his golden touch had worked at the CLC as well, but that was not to be. In 1972, India suffered a major credit crunch and export financing was withdrawn. The CLC suffered enormously as a consequence. Nagappa Chettiar’s health too declined around the same time and the Company faced difficult times. The banks stepped in after prolonged negotiations in 1981. This was the decade when Chromepet began developing fast as a residential and industrial area. The land on which CLC stood became far more valuable than any promise its erstwhile leather business had held. In 1993, much of the shares of the Company were acquired by a private trust that was into education. It consequently took over the assets and began selling them piecemeal. The gateway and the compound walls of CLC stood for long and have now vanished as well. A warren of shops and factories has come up there. The thoroughfare leading to this maze is still CLC Works Road. That, and the name Chromepet, stand testimony to a pioneering leather enterprise.